Gad Ganesh Temple….commands great views! There are interesting facts on Garh Ganesh Temple Jaipur history. What is Garh Ganesh Temple history? Garh Ganesh temple predates founding of Jaipur city. Garh Ganesh temple makes a departure from the usual temple architecture. Have you ever thought why Garh Ganesh Temple was built as a small fortification? It was a part of a defense system envisioned by the Maharaja Sawai Jai Singh II, the founder of Jaipur city. Do you know that Jaipur City Palace and Garh Ganesh temple falls on the same axis? It was planned in a way that Maharajah Sawai jai Singh II could get a glimpse of Garh Ganesh Temple from his palace room. Garh Ganesh Temple falls on the same axis as City Palace Jaipur. Also Read the related post, Gad Ganesh Temple, Jaipur…..Imposing! Garh Ganesh Temple could serve as a hide-out for a small duration for Maharajah Sawai jai Singh II in case of any war or battle. Its strategic location helped the ruler to keep a vigil over the surrounding areas. Garh Ganesh Temple provides an expansive view of the road leading to Delhi. 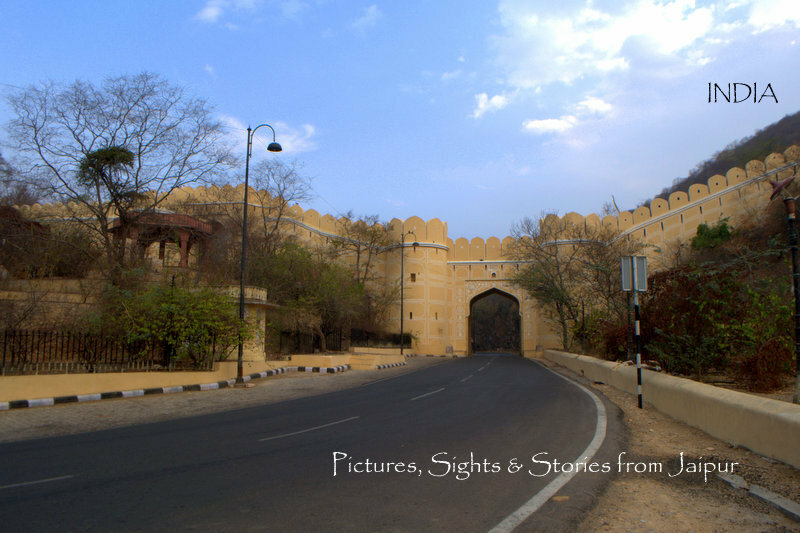 Aamagarh, a similar fortification on the eastern hill range in Jaipur covered the road from Agra city. It’s an accepted fact that Maharaja Sawai Jai Singh II was very intelligent & perceptive. Having fought many wars & battles leading Mughal army as a general must have imparted him insights on building a defense mechanism for Jaipur city. Click here to read about other Heritage Temples in Jaipur. Pingback: Gad Ganesh Temple, Jaipur…..Imposing! – Jaipur thru my lens ! !